So tiny and perfectly camouflaged that they escaped the eyes of divers and marine scientists for decades, the Pygmy Seahorses are fascinating creatures and perhaps the subject of future aquarium husbandry efforts if their behaviors and feeding habits can be deciphered. With some environmentalists calling for extreme protections of stony corals in the wild, Dr. Ronald Shimek powerfully points out how they are wrong. Changing acidity levels in the world’s oceans spell major trouble for coral reefs in the coming decades, and Shimek argues that reef aquariums may be the ultimate safe haven for truly endangered corals and other marine species. Fish behavioral expert Prof. Ellen Thaler heads to the shallow atoll waters of the Maldives to record the interactions of different species and the state of reefs hit by major bleaching events. A long-awaited full feature on Zoanthus spp. 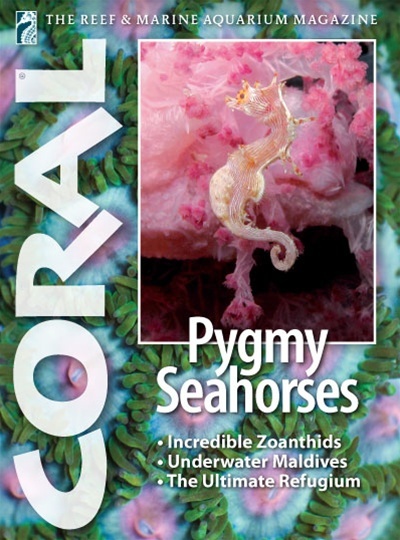 polyps by marine biologist, collector, and aquaculturist Colin Foord details the natural history and keeping “not always easy” of the flamboyant and irresistible zoas or zoos.